I’m not keen on plant labels in private gardens, unless they are well incorporated into the overall design, such as the lovely, hand-drawn herb labels I often see and admire. 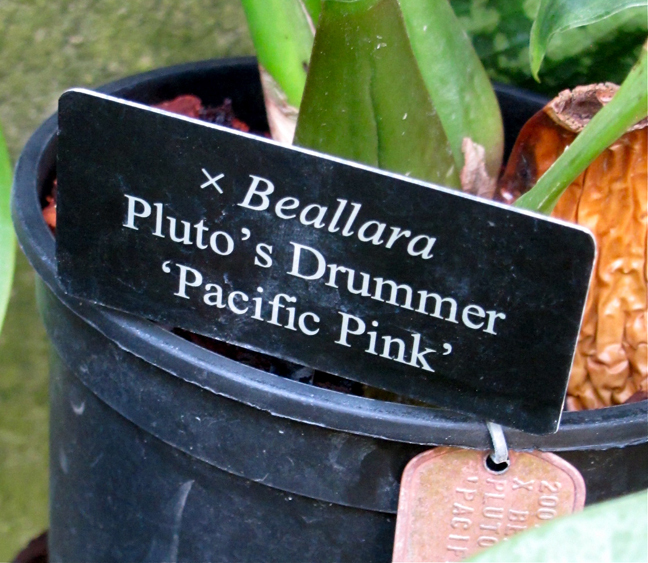 As a photographer, plant labels are a mixed blessing, often obscuring the shot or making it look regimented or untidy. But they’re extremely welcome when I want to be able to name a plant, for example if I’ve just taken a picture of it, or I want to grow one or recommend it to a friend. I tend to snap pictures of any labels as a quick way to identify them later. We should never underestimate the time, money and devotion that is needed to label a large collection of plants professionally – and to keep the plants growing where the labels are! Longwood Gardens were taking no chances with the special display of orchids I enjoyed seeing in 2013: this one is identified twice. To put their caution into perspective: it seems strange but visitors do sometimes take plant labels as souvenirs or move them and forget where to put them back. I also once heard of an extensive, painstakingly sourced collection of wild roses that was accidentally labelled using a non-waterproof marker. The roses themselves are safe but all their names were lost: some of them, perhaps forever. It’s more difficult that you’d perhaps imagine to conclusively identify a rose just from a picture: hybrid tea flowers can be fairly consistent, but the blooms of many shrub roses aren’t all the same, even on a single plant, as I’ve explained before. Often more than just a close up picture of the bloom is needed, including the foliage and the overall plant. So I wasn’t surprised when no-one was able to name the mystery rose I posted recently, despite several people, including The Redneck Rosarian, kindly enlisting the help of their Twitter community. I’ve had many ‘rather you than me’ moments in the past, watching colleagues receive scraps of faded plant material in the post, together with a plea for help to identify the variety of rose. Believe me, a carefully preserved herbarium specimen often has little in common with a rose or leaves sent unmounted in a thin envelope by second class post! And I’ve seen extremely distant or blurry pictures that have been rather optimistically sent for identification where the rose could have been pretty much any other leafy plant so far as it was possible to tell. A decent picture is often easier to work with than dead plant material, but even when a series of clear pictures was available, showing both the plant and close ups of the flower, I’ve often witnessed experts disagreeing with each other, and even changing their minds about their attribution over time. I was reminded of this yesterday when I decided to create a photo gallery from several pictures of Rosa ‘A Shropshire Lad’ – an English rose which can be grown as a large shrub but is more often trained as a climber. I love photographing this rose so I have many different pictures which rarely see the light of day. The pictures, taken with the same camera at different times of the year, show quite a variation in colour, from soft apricot to pale pink. Some of this can be put down to the light conditions early or late in the day, but not all. The rosette shape also varies, not just as the blooms open, which you’d expect, but also in the fully open flowers, which you might not. If I didn’t know they were all pictures of the same rose, I wouldn’t have believed it. The one below seemed just too misleading to use, though I would not have said it was a bad shot. 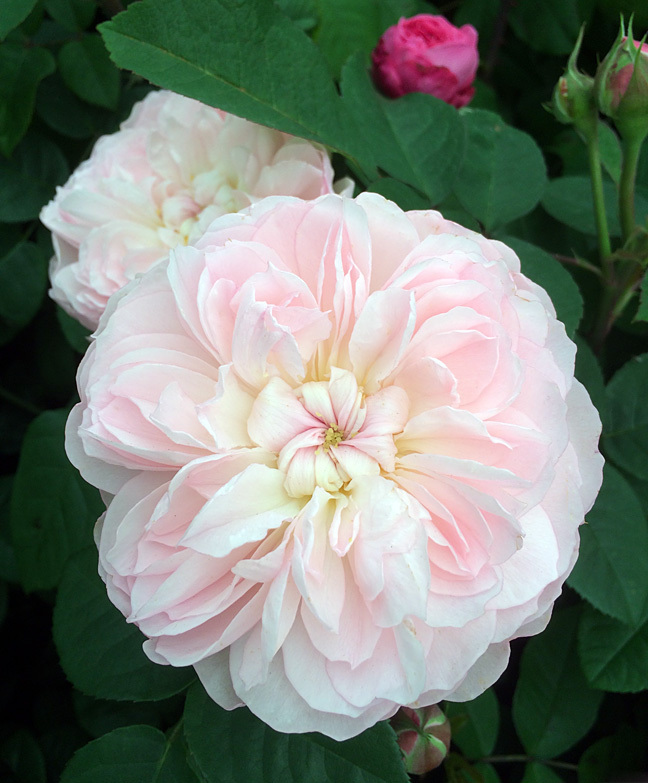 But if someone else had showed me this ‘A Shropshire Lad’ bloom, cropped from a wider shot, I’d be convinced it was Rosa ‘Queen of Sweden’ or something similar, even though in the flesh – or should I say ‘in the leaf?’ – I could never imagine mistaking one of these plants for the other. They are almost opposites in stature, flower size, fragrance and habit. This bloom, viewed as a crop, seems too demure and too pink to be ‘A Shropshire Lad’. 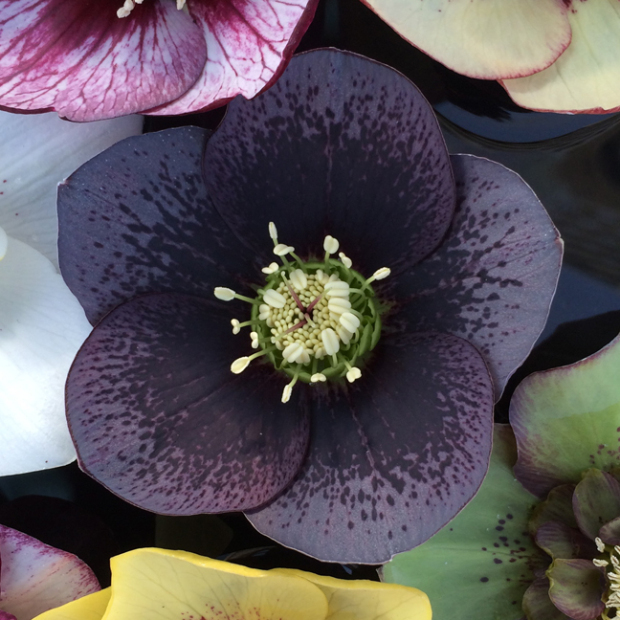 There’s a real art to identifying named plant cultivars – even professional growers mix plants up now and again. During a visit last year to Brent and Becky’s Bulbs, I was intrigued to learn that they grow a sample bulb of each variety they sell every year so they can check it has been named and identified correctly. I’m not sure that every plant supplier will go that far – or have the knowledge and experience to spot subtle differences between cultivars – but it’s part of the pride this family company takes in its reputation. For amateur photographers and bloggers, all we can do is act in good faith. 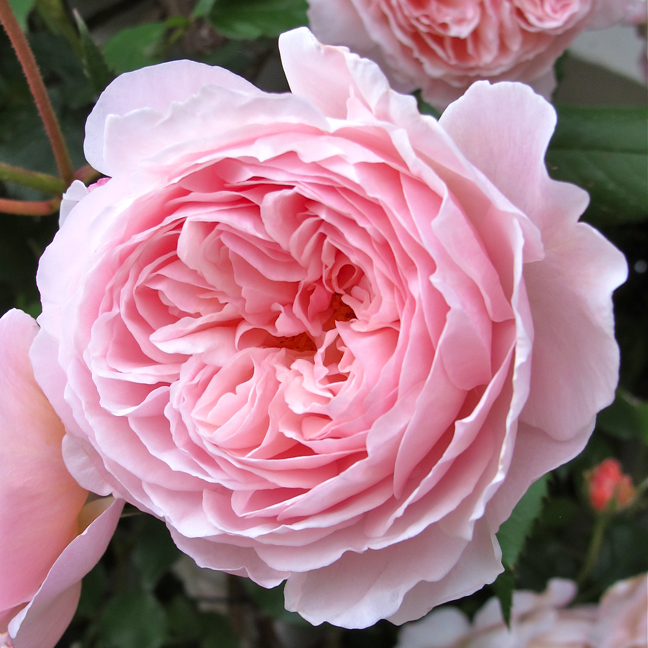 If in doubt, we can always identify pictures less precisely: for example, a rose rather than Rosa ‘A Shropshire Lad’. Sadly, we won’t always get that right either: I’m still very new to blogging, but on Pinterest, I’ve frequently seen a peony or ranunculus being called a rose, or the other way round. I’m not claiming to be infallible myself: I am always happy to be corrected when I get things wrong. Despite this, it rarely feels appropriate to me to comment on a pin, however gently: ‘that’s a rose, not a peony’ or to offer a name unless the pinner asks for help. Some of the pictures have been so widely pinned it’d need an army of editors to make much difference. 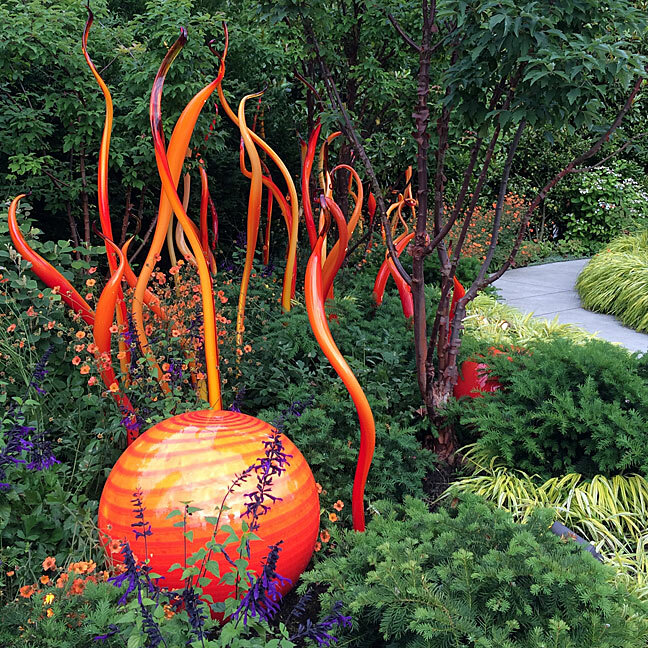 And many of the pinners clearly aren’t experienced gardeners, they’re just celebrating beauty. I’m sure I’m not the only one who finds the social etiquette of this a little tricky – should we offer help or smile and think it really doesn’t matter? This all reminds me of an identification tip I have for gardeners in the UK, Europe and North America – if you see a shrub rose with head-turning beauty in full flower around this time of the year, it’s a camellia. All the roses are looking a bit sorry for themselves. Oh, the camellia across the street has one bloom open and ours will be next. It wishes that it weren’t on the south side of the house and would like to be a bit more protected, but is not a plant I dare move…. Perhaps not – I imagine it would take a fair bit of digging if it’s an established plant. Perhaps you could get another one for the other side, or even take a cutting. Right up against the house, so gets heated by the sun…..